A lot goes into throwing a Halloween party, so I thought this week I’d list some of my favourite Halloween hostess gifts. I recently was inspired to design these pieces and have shared many more items on my Redbubble account – please check it out here. Below listed are some of my favourite Halloween inspired items to use for the month of October. 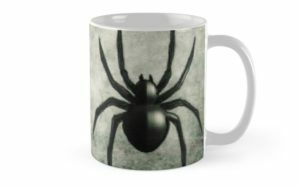 Spider mugs on acid wash backgrounds. For the Rouge mug click here. 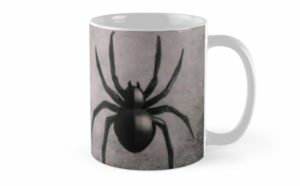 For the Black mug click here. 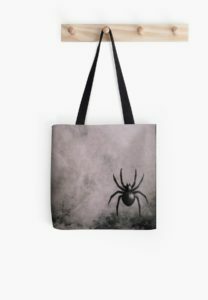 Spider tote bag in black – Please see listing here. 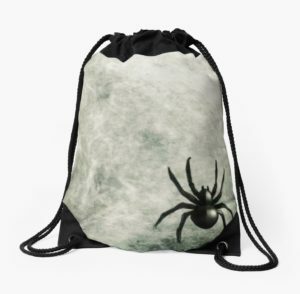 Black spider drawstring bag – Please see listing here. Rouge Spider tote halloween bag – Please see here. 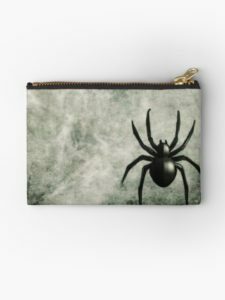 Black spider clutch purse – please see listing here. 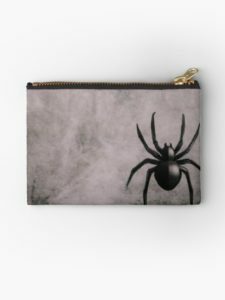 Rouge spider clutch purse – please see listing and details here. 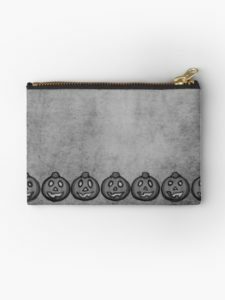 Black pumpkins on acid wash clutch purse – please see listing here. 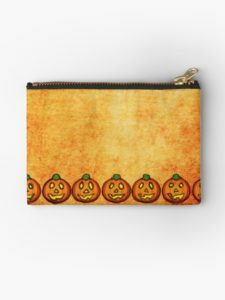 Orange pumpkins on acid wash sturdy clutch purse – Please see here. Lastly, my favourite notebook of this Halloween 2018 design portfolio. Redbubble offers hardcovered journals in blank, lined or grid page options as well as spiral notebooks. My preference is the hardcover journals. They are approximately 5″ x 7″ – so awesome to throw in a bag and bring with you everywhere. I always choose blank pages for sketching – grid and lined options are available too. I’m pretty hard on my notebooks, I squish pens in them and toss them around. The hardcover notebooks have held up well for me. Again, I test out the products for durability and I’ve been happy with what Redbubble offers. Redbubble also takes 100% returns – so if you’re not happy, they gladly take the item back. To see my profile and portfolio to date, please click here. 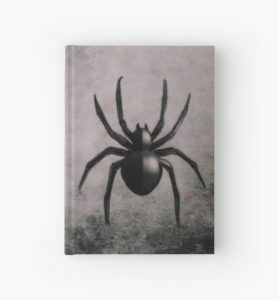 Rouge spider Hardcover journal – please see page options here. 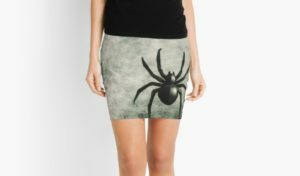 Spider pencil skirt – the pattern is repeated on the back as well – see more details here. As of today, shipping within Canada is scheduled for October 5 – 9th. Please check Redbubble website for discounts on multiple orders as well as shipping timeframes. NEXTAre you a maker, do-er and thinker?